Spoil your guests with this deliciously rich, creamy pâté, that makes a very quick and easy-to-prepare starter. Heat the oil in a frying pan and fry the chicken livers for 8-10 minutes over a medium heat, stirring frequently until cooked through. Using a slotted spoon, transfer the livers to a food processor. Add the shallot, garlic and thyme leaves to the pan and fry for 2 minutes. Pour over the sherry and simmer for 30 seconds. Transfer the shallot mixture and all the pan juices to the food processor, along with 100g of the butter and the orange zest, juice and seasoning. Whizz to a smooth paste. Spoon the mixture into a sterilised half litre kilner jar (or between 6 small ramekins or small serving dishes) and allow to cool. Melt the remaining butter in a small pan, then remove from the heat and let the milky residue settle at the bottom. Spoon a little of the liquid from the top over the pâté to cover, then chill until set. 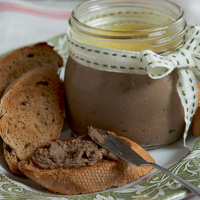 Take the pâté out of the fridge 15 minutes before serving, with granary toast. This pâté is lovely served with a winter salad. Torn chicory leaves, watercress and slices of orange drizzled with a little walnut oil make the perfect accompaniment. Our Dry Oloroso Sherry has elements that will both match and contrast with the rich flavours of this pâté.